NOISELEZZ anti-snore mouth guard is a two trayed hinged device, worn in the mouth while sleeping. It is made of soft high quality dental resin for improved wearer comfort. This anti-snoring solution greatly reduces snoring or eliminates it entirely. By fitting the top tray over the top teeth and the bottom tray over the bottom teeth, the hinged mechanism gently pulls the bottom jaw forward and stops it falling back, keeping the airway open and preventing the tongue from touching the soft tissues at the back of the throat. Sleep clinics prescribe mouthpieces to their patients, with a 94% success rate. Noiselezz® Snoring Mouth Guard is patented world wide, granted on 4/9/98, serial number 691849. 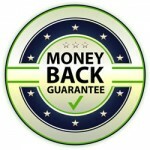 The guarantee is offered for 30 days from the date of purchase. If for any reason you are unhappy with the NOISELEZZ snore mouth guard, you may return it for a full refund less the shipping costs, providing you have not damaged, mistreated or adjusted the device in anyway, including moulding the product in warm water. You must send back the device in its original packaging with the instruction manual so that it can be examined by our technician for any defects. Click here to Order now. This option suits those who wish to SAVE some money and are already familiar with the NOISELEZZ snoring mouth guard, and so do not need a guarantee. Click here to Order now. No more complaints about snoring from your partner. No more sleeping in the spare room. Easy to use – get snoring free and restful sleep. KVG is a privately owned Australian company with the sole rights to distribute Noiselezz® in Australia & New Zealand. We are primarily a service company and pride ourselves on our fast, friendly and professional experience that we deliver to our clients.